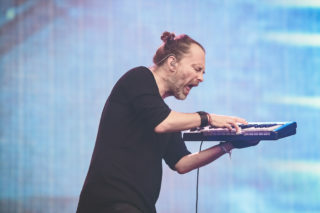 As Radiohead’s first open-air show in Manchester for nearly a decade draws to a close, the crowd could be forgiven for thinking that nothing would surprise them any more. And then they play ‘The Bends’. 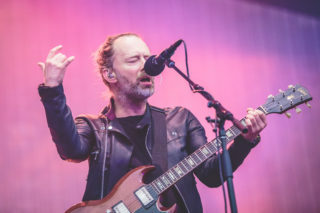 Anybody who thought they might have had tonight’s setlist figured out off the back of recent festival appearances was proved dead wrong right from the get go, with ‘OK Computer’s ‘Let Down’ bringing the curtain up for the first time ever, instead of ‘Daydreaming’ (although tonally similar). 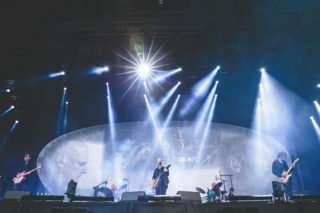 Radiohead have played at this venue before, when they were touring ‘In Rainbows’ back in 2008, but tonight’s visit was not part of the original itinerary; instead, two gigs were to be played indoors at the Manchester Arena, until the tragic events of May 22 forced its closure until September. Even with ticket-holders from both sold-out scheduled dates in attendance, this is still by no stretch of the imagination a capacity crowd, and the predictably dismal July weather hardly puts a spring in anybody’s step. This is also their only other English show this year. 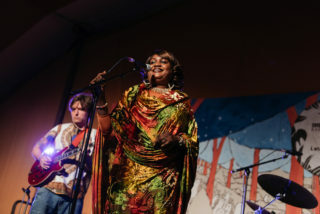 Still, this is a band who’ve had some of their finest moments in front of rain-sodden crowds – not least at Glastonbury in the past, where they headlined last week. 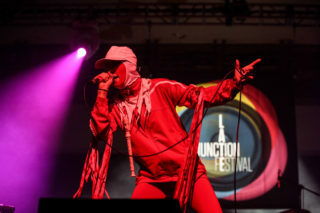 The festival’s atmosphere lingers in places – not least when a spontaneous chant for hero-of-the-hour Jeremy Corbyn breaks out after ‘No Surprises’ – but even just 10 days on, the overwhelming sense is that Glastonbury’s already in the rear view mirror, with tonight’s set taking a step back from the deeply uncharacteristic nostalgic approach that they took at Worthy Farm. 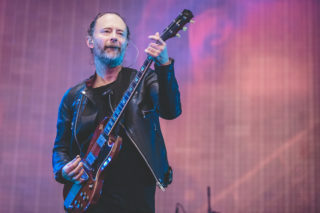 And that’s a good thing, too; you’d rather hear ‘All I Need’ than ‘Exit Music (For a Film), because it’s a far superior track, and if we’re going to lean heavily on the lately-twenty ‘OK Computer’, we might as well hear one of the unreleased cuts, like ‘I Promise’ during the second encore. 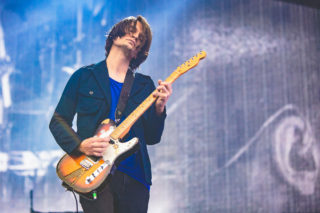 It’s still fascinating, though, that the group seem quite happy to revisit the past when, ostensibly, they remain in the thick of a tour that’s supposed to be behind ‘A Moon Shaped Pool’, off of which we only get three tracks. 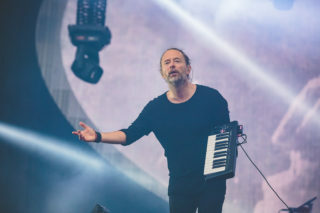 There was once a time when Radiohead loved to play unreleased cuts – ‘Ful Stop’, which shows up three songs in tonight, was also aired at the band’s last Manchester show in 2012 – and their recent diversion into romanticising the past is peculiar. 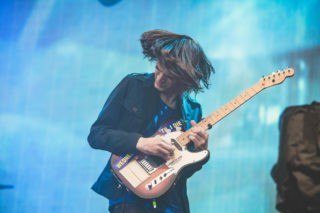 Of the nine tracks they perform across two encores, only two are less than a decade old. 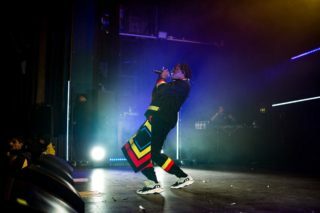 Both committed fans and those who were too young to remember the nineties should enjoy this current run – they surely won’t carry on this celebration of past glories for too long.